ihickson: New big girl bed! We got Molly the convertible crib with every intention of making it into a full size bed frame once she was big enough. Then she had her first sleepover before her third birthday and I realized that might not be the best solution. I did like the idea of her having a full size bed and wasn't sure I wanted to sacrifice that for a twin trundle bed. I kept pushing it off and casually looking. Then I noticed she was sleeping at an odd angle so her feet could hang off the opening from her toddler rail and knew I needed to kick things up a notch. In fact the last month or so we just put her mattress on the floor so she could hang off the end of her bed in a more comfortable fashion. She technically still fit on the bed, but she would always scooch down to the end of her pillow which caused her feet to hang off. 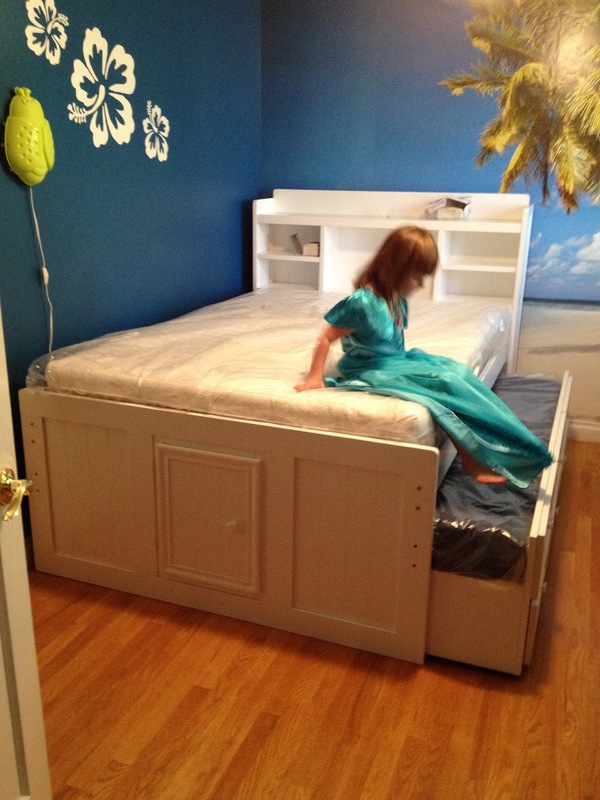 Just after Thanksgiving I found an awesome Captain's bed (full size) with a twin trundle underneath. The best of both worlds. It was finally time to break down her old bed. Moving her toy storage shelves over to the corner by her door. The glider is now in our living room. Molly watching the movers bring everything inside for assembly.